Beautifully decorated, ground-level, two bedroom condo located on the Intracoastal waterway in the highly acclaimed Barefoot Beach Resort, Indian Shores, Florida. We are directly across the street from the beach. Watch dolphins play from your private patio or enjoy the soothing flow of boats glide by as you sit and enjoy the sunshine just steps from the waterway. Boat Slip available for your use at no extra cost. This quiet and sparsely populated section of the beach island makes it feel like you have the beach to yourselves. Enjoy the resort's heated pool and private fishing dock. This professionally decorated, Key West style condo is surrounded by palm trees and other tropical plants providing the vacation setting you were looking for. If you have a boat, slips are available for rental. Fabulous restaurants and pubs nearby... the upscale Salt Rock Grill is next door to the condo and one of the best places to eat in the entire area! Beach shops, Miniature Golf, Suncoast Seabird Sanctuary, Tiki Gardens, and Town Square Nature Park are all within walking distance. A Suncoast Trolley Stop is located in front of the resort and runs from Clearwater Beach to John's Pass and Pass-A-Grille Beach. Busch Gardens and the Lowry Park Zoo are just 45 minutes away; Walt Disney World, Universal Studios, and Sea World are 90 minutes away. One stay and you will discover the charm of Indian Shores, a true hidden jewel of Florida's Gulf Coast! The Barefoot Beach property is peaceful, quiet and is beautifully decorated with tropical plants and trees. This section of the gulf beaches has the feel of small town Florida. We like the convenience of parking right outside the condo front door. Water view from every room in the condo. We see dolphins and other wildlife on every visit. Watching the boats cruise by is very relaxing. We have two bikes for riding along the beach road which has a dedicated bike lane. Boat Slip out the back door for your boat. Shower has multiple shower heads. Bathroom has hair dryer. Bathroom Towels are provided. Four Beach towels are also provided. Fully stocked kitchen with toaster, coffee pot, tea kettle, blender, pots and pans, baking sheets and tins. Two bicycles for riding along the beach road bike lane, TV and DVD player in each bedroom, Beach Chairs, Umbrella, Cooler on wheels, Beach Toys and Boogie Boards. Boat Slip for Guest use. Location is amazing! Walkable to a couple restaurants and beach. Layout of condo is comfortable. Pool and fishing docks were SO nice! Heated pool was an added bonus. West bedroom bed is comfy. Appreciated the four beach towels that were there. It was nice to leave ours in Michigan. Enjoyed sitting on intracoastal watching the wildlife and boats. +Cleaning staff needs to pay attention to details. Found an empty carton of cigarettes under a nightstand in the east bedroom, an old pillow left inside the pullout couch and multiple dead palmetto bugs(cockroaches) inside west bedroom! Eek! Had a hard time sleeping once we found them. Owner politely explained that the bugs die once they get inside but then did not send cleaning staff over to take care of them. +Of the two bikes in the condo, one has a broken seat. We didn’t get to use them. +Hinges in bathroom are rusted but owner said he will be changing them soon. + My son tried to fish with the fishing supplies but had a hard time. The fishing tackle is very old and poles are in need of fishing line. +Toilet seat cover is scratched and needs replacing. +East bedroom bed is very hard. +Beach umbrella doesn’t work. It won’t stay open. There is a piece missing. +Cooler in closet is nice but very large! We were hoping for a small soft cooler to take with us to the pool or beach. We love Indian Shores and have stayed in this area many times in the past. Despite the amazing location of this condo we probably will not stay here again because of the dead palmetto bugs in the bedroom. I will not recommend this condo. As owners we love to help guests that communicate with us. This guest did did not communicate their needs to us. Would have loved to had the chance to increase their enjoyment. This was a great location to take the family. 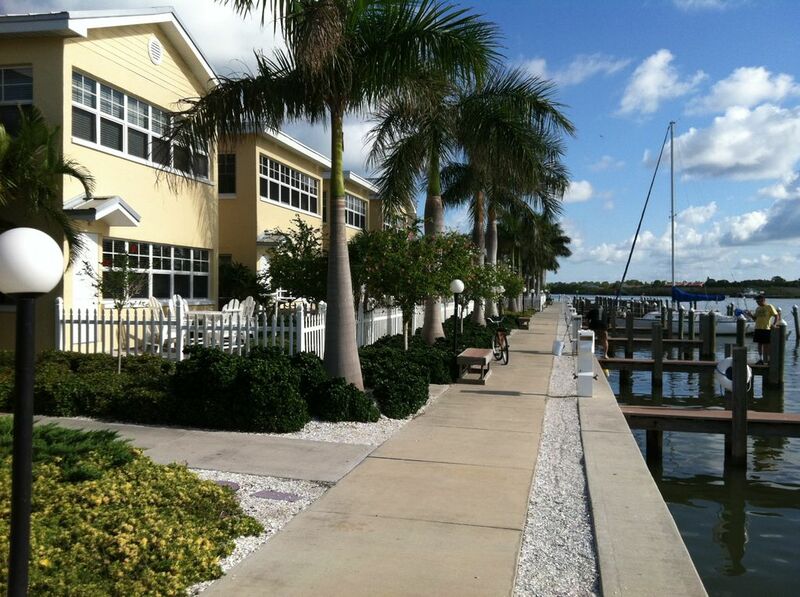 It is a very nice place in a great neighborhood with easy access to the beach. We loved seeing the dolphins sitting outside at the patio area. Overall, a great place to stay! Thank you for such a nice review of our property. So glad to got to see the dolphins. They are very popular attractions along with much of the bird life such as sea gulls and egrets. This condo was so lovely and was equipped with everything you needed. Beds were very comfortable. The view was the envy of many as they strolled by our condo. We enjoyed our daily “dolphin shows” and the beautiful boats as they quietly went by. Great beach access and the beach trolley was close by. Cant wait to go back again! Thank you so much for your lovely review. Look forward to having you return. My family's vacation was ruined by roofers overhead, nails and trash inside and out, cockroaches, and no hot water in this condo. Water heater did begin to fail and we replaced it within 24 hours. So guest had a fully functional water heater for 6 of 7 days. Let's be truthful in our reviews. We went to great lengths to respond to this guest's requests, but she could not be satisfied even after a refund. We had guests in the condo just prior and just after her stay who fully enjoyed the condo, its amenities, and the Indian Shores and Gulf Beaches area. Please come enjoy this wonderful vacation spot. Barefoot Beach Resort is located on Sand Key in the town of Indian Shores just across the two lane road from a spectacular beach with a private walkway to the beach from the resort. Tourist activities abound both north and south. Boating, golf, parasailing, dolphin tours, sunset boat tours, jet skiing, and more.